The Broke and the Bookish : Libraries still exist? I get the majority of the books I read from my public library. Free books! What could be better? One day last week I was talking to a couple people I work with and one of them asked how I can afford to read so many books. I told her I get them from the library and her response was, "libraries still exist? "...Yes, my coworker really said that. And she reads too! Not often but she reads at least a few books a year. I am still shocked that there are people who think public libraries are extinct. Is it just because people are unaware of the free books, DVDs and CDs that library offers? My town's library is small but I can usually get any book I want from any other library in the state. It breaks my heart to know that people are unaware of the fantastic resource that is the library. The library is so much more than just doing research for a school paper or project. So fellow readers, are there people in your life who are also clueless about all of the wonderful things that libraries have to offer? Weird that someone would think that! Obviously, lots of libraries have shut down, but the one I frequent has made lots of changes to keep itself relevant. It offers e-books, has a 7-day Express checkout for new books, lets you request books even before they're published, has tons of computers for people to use, etc. etc. Even though I have a city library a couple miles from my house, I drive the 15 or so miles to the county library because it's just SO awesome. And busy, too. I love it! I definitely think that a lot of people assume library's don't exist anymore because of e-books and e-readers. I am a huge advocate for the public library. I drove several of my friends to the library, so they could library cards. I then gave them a tour and showed them where the DVDs were, the D&D books, comics, etc. They were so surprised that the library had such a variety of items.The public library is a poor grad student's best friend. Besides being able to get books at my current library, I can get DVDs, Blu-Ray DVDs, and video games. I <3 my library. My niece asked me the same thing. I go to the library on the weekends too with my husband and get movies. Free movie "rentals" for a week? That's worth $7 minimum at Redbox. I work from home and listen to books on tape. They make the day go faster. I've borrowed so many I lost count. I love the library! I love "renting" movies from the library. Redbox gets to be expensive if you forget to return it the next day! I love my local library. And the country library. And the neighboring city's library. I can get pretty much everything from there! <3 I love your comment. Yay for librarians! I've never used them but I know my local library also has free/discounted museum and zoo passes. I work in reference at a public library, but even before that I was a weekly visitor at my hometown library. It's a thriving community center, even though the county is serves is relatively poor; the city invests a lot of money into it. I'm also enormously fond of my university library: though three years a graduate, I still drive up there once a month to check out titles. Being a uni library, they have a lot more detailed nonfiction than my local can afford to keep. As a librarian, that just hurts my heart. I love our library service it is excellent. They get most requests for you and we have events too. WOW--that is amazing--and not in a good way. 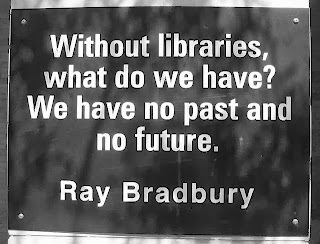 I haven't encountered anyone who thinks libraries no longer exist, but I think many people don't have a good concept of all of the many resources that libraries offer. 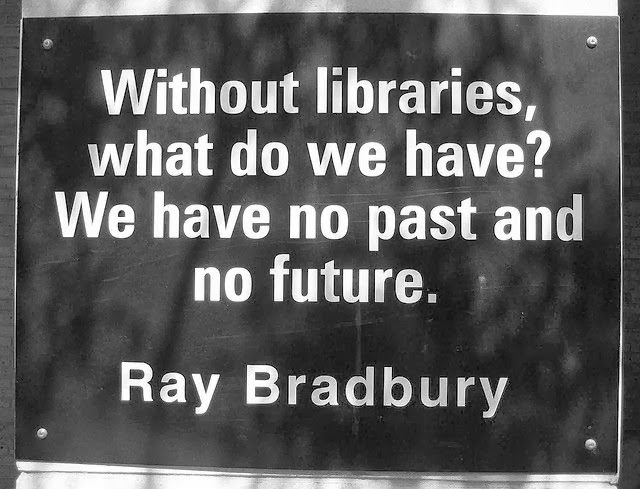 A lot of people think of books and only books--and most libraries offer so much more. wow that is just sad that people do not know what is in their own community and it is FREE. I volunteer at the library so I'm there every week looking to pick up books or movies I haven't yet read or seen for free. If the library wasn't there I wouldn't be able to afford all of the books I read in a year. Every month or so, someone brings up the "everything is on computer/e-reader" statement, and every time I answer with, "We heck out a quarter of a million items every year, and none of them is a computer." The fact that our numbers stay pretty much the same tells me we aren't going anywhere soon. My family goes to multiple libraries weekly (we have cards for 3 systems, which equals almost 10 branches!) so this is mindboggling to me. In fact, there is a new library being built in the city next to ours and it is going to be SO COOL that I already know I am going to move in and live there. I'm so excited for it, and if I had an opening date, I would literally be counting the days. Libraries are THE BEST. This makes me sad, too! In my family, I think I'm the only person who uses the library (and not just because I work there!) and also one of the only ones (besides my mom) who reads. I think a lot of people don't understand that a library isn't just books anymore -- libraries evolve with the times and now you have computers, CDs, movies, events .... just ask your local librarian and I'm sure they'll give you a huge list of things the library offers. And here we only pay $12 for a membership per year that it's totally worth it. I have bought a LOT of books in the past and I still do buy, but the library really is great for getting books. I can't wait to share it with my child! Omgoodness. *smh* I love my library. I am there all the time. They even know me by name! :) I will go and get 4 books at a time even though I have shelves of unread books at home. My friends and family all tell me how they want to read a certain book and I will tell them "the library probably has it" and then they will hem an haw about it; making some excuse that they just can't "get around" to going there and getting a library card like it is a difficult task. I. Do. Not. Understand. FREE BOOKS!! FREE MOVIE RENTALS!! They even have free Wifi at my library. Whaaaaaaat!!! I can't believe some people actually think something like that! I don't know what I would do without my library, I could live there if I could lol Some of my friends are actually like that though but that's the reason why I chat with people online about books more. So sad! Thanks for posting about this! I read so much that I'd go broke if I bought all the books I read. Hooray for libraries! My library is basically the only way I can read books for my blog. I'm extremely lucky too, in the fact that my library is not only pretty well-stocked but it has a inter-library loan system which I don't think is something people know about very often but trust me, it's a beautiful thing. Especially if that system is like mine, and has like ten libraries to choose from, including a huge brand-new one that just got built like a year ago and is gorgeous and has all the new library goodies. Basically, libraries are awesome. I wish more people would use them. I think part of the problem is, other then the occasional sign, most are not advertised so people don't even know libraries exist unless they drive by it or something. I would say, advertise more, but I'm pretty sure libraries get a pretty set budget so I'm sure they don't have the money to advertise it. I volunteer at one of the local libraries (there are two in my city) and they're always packed with people of all ages. Even when I was living at home in a small town, it was rare that I didn't find myself in a crowd of people at the library. Libraries are wonderful and a lot of libraries (at least that I go to) have been coming up with more activities and events to get people into the library. A lot of people don't have any idea what you can get at our local libraries. The sad thing is that some people not only don't know what the library has, but don't even know that the library is there. This past week I was speaking with a college student who had just discovered our town has a public library. I was so surprised she hadn't heard sooner! Oh my! I hope you gave your coworker directions to the library and told her to check it out! That is really sad. Ah, this breaks my heart! My youngest sister, who's 20, and her friends usually have no idea what I'm talking about when I talk about the library (I get a LOT of books from my local library). And I'm always like...yes...it exists and you can get all kinds of stuff there! You're so right! Also, I listen to the Book Riot podcast and they mentioned (last week maybe?) that there are sooo many other services that libraries and librarians provide! Internet access, they can get you started on research, recommend books, help you create an email address or apply for a job online! Libraries are the best! I go there several times a week, not just to get new books/movies/cd's but for events or to just sit there and read for a while. It has such a great atmosphere. We have awesome libraries in Vegas. They have tons of books, inter-library loan, movies, music, magazines. There's lots of programming for kids and adults. They show movies, have book clubs, craft clubs, writing clubs, and so much more. It's sort of like the people who act like the concept of a "Netflix for books" is such a unique idea. I'm just like "guys, that service had already existed for a while. It's called the library. " And her response was... "So, do you get it for Kindle first?" I was just totally at a loss that a reader and blogger would completely ignore a source of free books to the point of forgetting it exists.